Hello Everyone! I hope you are looking forward to the weekend like I am... :) Are you setting aside some time to stamp and maybe to shop as well? 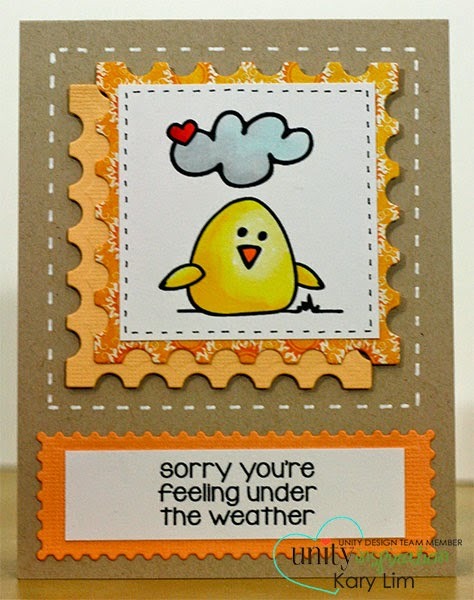 You might want to sign up for this little cute Stamp of the Week - Lil Peep Under the Weather. The cute lil peep is coloured with Copic Markers (Y08, Y02, Y00, YR04, R24, R29, BG0000, N0, N1). There's only 2 more days to get THIS WEEK'S Stamp of the WEEK! Click on the link to find out how to order the set.